Sometimes we need to test our projects not because we have changed anything, but because maybe our dependencies have changed, or we want to have an automatic build to get a nightly release out. Today, we are happy to announce Crons, simple scheduled builds for your repositories! This exciting feature is available for both open source and private repositories today. In cooperation with a Bachelor’s project team at Hasso Plattner Institute in Potsdam (more about this fantastic team soon), we have added the functionality to create crons to your repository settings. This new feature has been released into our Beta Features program, and we would love to hear your feedback! Have a suggestion on what we can improve, or maybe a bug you ran into? Please let us know by leaving a comment on our Crons Beta Feature issue. 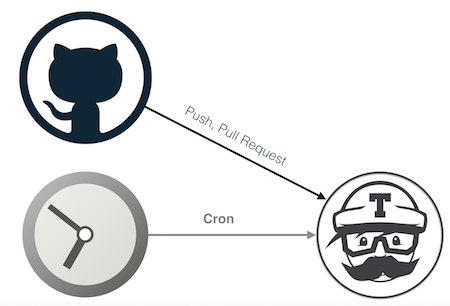 Cron build schedules can be defined by a build interval that is either daily, weekly, or monthly, with the cron starting around the time it was created. For more information, please read the documentation.